Generously brushed with a bright red blush on a yellow-gold background, its crisp ivory-colored flesh releases a spurt of mouthwatering juice that is deliciously sweet tart. This apple is merely a Gala apple picked at a small size. Available June and July from California orchards and from Washington State other months, the striking Lady Gala apple is a year-round apple. Some apple varieties are "Club" apples meaning their production and acreage are patent-controlled. Only a select few are and can be grown each season. Providing satisfying bulk with few calories, an apple has about 80 calories. 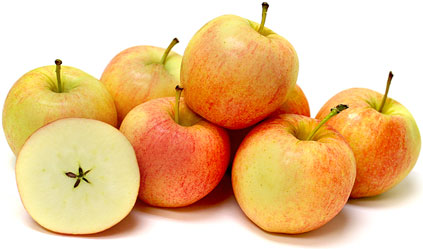 Cholesterol-free, apples contain pectin, a beneficial fiber. This dietary fiber may actually work to reduce the body's cholesterol level and possible help prevent heart attacks. Pectin also slows glucose metabolism in diabetics. Apples contain potassium which may reduce the chances of a stroke and have a trace of boron believed to build bones and to increase mental vitality. Apples offer a small amount of vitamin A and vitamin C and have only a trace of sodium. Unpeeled apples offer the most nutrition. Eating five daily servings of fruits and vegetables lowers the chances of cancer. A recent study found that eating nine or ten daily servings of fruits and vegetables, combined with three servings of low-fat dairy products, were effective in lowering blood pressure. Not only great for eating out of hand, this attractive apple's exceptional good looks makes it perfect for decorating table centerpieces. Add to a fresh fruit or Waldorf salad. Pair with sausage, meat and fowl dishes. Cubed, sliced or grated, an apple adds an instant delicious zip to a dish and never overwhelms other ingredients. Sliced or cut apples stay white longer if put in a bowl of water with two tablespoons of lemon juice. To store, keep in coldest part of refrigerator. Today apples are a very important fruit in North America, Europe and other temperate regions in both northern and southern hemispheres. Although apples are a very old fruit, the Lady Gala apple is a relatively new variety. USA grown, Washington State and California are major producers of this fine apple.